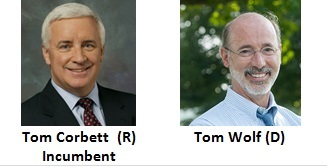 Are you looking for a nonpartisan voter guide to the Tom Corbett vs. Tom Wolf Governor's race? One that will give you an unbiased, no-spin comparison of candidate positions on key issues? That's what our Campus Election Engagement Project guide will give you! We are a national nonpartisan initiative working with college and university administrators, faculty, and student leaders to increase student participation in America's elections. For the 2014 elections we have created and distributed voter guides to campuses in more than 20 states so they can provide their communities with accurate information for informed voting. Because these guides have been so well received and are useful for all voting citizens who want to be better informed, we are also posting them here. So here are the issue-by-issue stands for Tom Corbett and Tom Wolf, with additional links at the bottom for each candidate if you'd like to dig deeper. Education: Do you support increasing funding for K-12 education? Education: Do you support the effort to standardize and increase school standards under the Common Core initiative? Corbett: No. Reversed his long standing support in Sept 2014. Education: Do you support providing vouchers to parents to send their children to private schools with public money? Education: Do you support increasing funding for higher education? Elections: Do you support requiring registered voters to present a photo-ID in order to vote? Elections: Do you support increasing restrictions on campaign donations? Environment: Do you support taking government action to limit the levels of greenhouse gasses in the atmosphere? Healthcare: Do you support the Affordable Care Act, also known as Obamacare? Healthcare: Should your state accept federal funds so Medicaid will cover people earning up to 138% of the federal poverty line? Wolf: Yes. Would shift back to a straight Medicaid system. Minimum Wage: Do you support raising the minimum wage? Wolf: Yes. Proposes 5% extraction tax. Unions: Should union dues be made voluntary for those represented by a union? Corbett: Would sign such a bill if passed by the legislature but not a priority.